A year or more ago, I came across an advertisement that included lanyards, bracelets and key fobs. 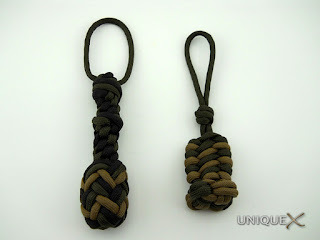 Though I don't remember the site or where it originally appeared, there were two key fobs in it that I really liked. I had totally forgotten about the key fobs until the other day when I was thinking of what type of key fob I wanted to tie to replace an old worn out fob. For some reason in my mind, earth tones go hand-in-hand with winter so I used three colors to tie these designs (black, olive drab and coyote brown). 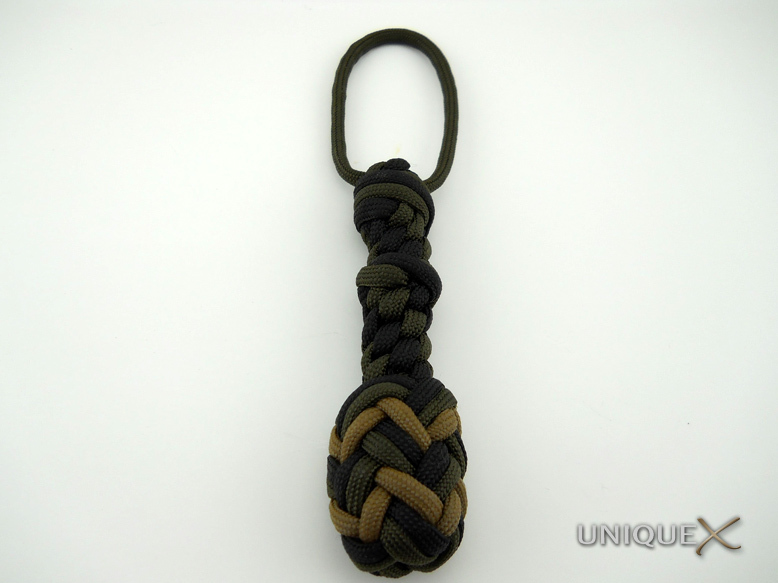 For the first key fob, I used five different knots and I will explain the process I used to tie the fob. I used three-four feet of black and olive drab paracord to tie the first section. Start by halving the cords so that you will have four strands. Then start tying a Round Crown Sinnet, after you start the sinnet, pull out a loop in one of the colors for the key ring, then continue tying the sinnet for about two to three rounds and then stop. Next, I tied a Four Strand Matthew Walker Knot (the video is for a Three Strand Matthew Walker Knot, but the instructions are the same). Continue tying the Round Crown Sinnet until you end up in the section of the fob that you want to add the Wall Knot. Continue tying the Round Crown Sinnet until you reach the length desired. Now gather a couple of feet of paracord in olive drab, black and coyote brown. 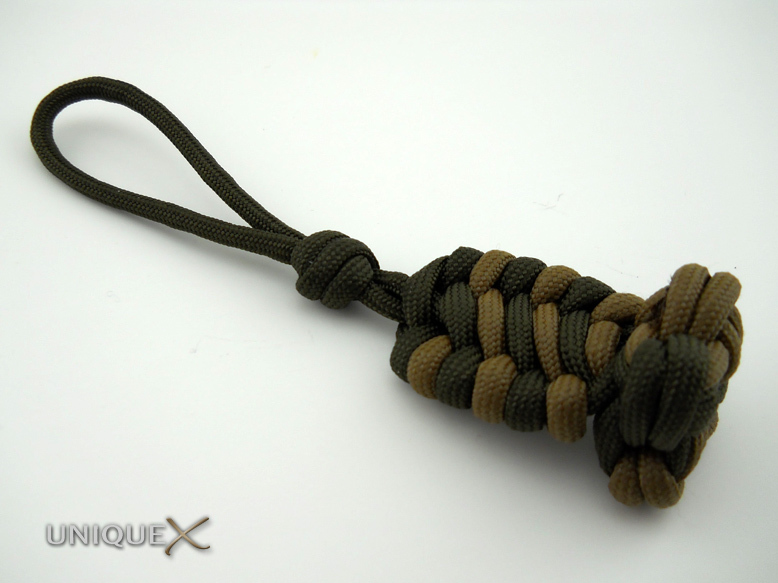 Using either olive drab or black, tie a 5 Lead by 4 Bight Turk's Head Knot that will be the base of your Herringbone Knot. 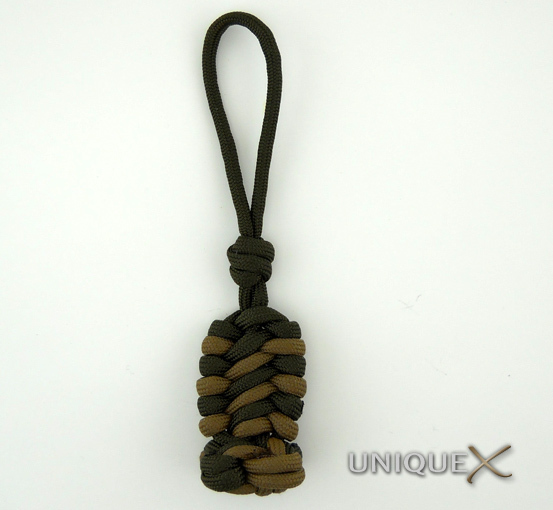 Using the coyote brown paracord, tie the Herringbone Knot. The instructions for the knot shows the bights protruding from underneath the black and olive drab strands, I didn't want that so I simply pulled them tighter underneath the other strands to hide the coyote brown bights. Cut the ends left over on the Round Crown Sinnet and singe them in place. Now place the Herringbone Turk's Head over the bottom part of the Round Crown Sinnet. Tighten and dress the Herringbone, then cut and singe the ends and hide them underneath the strands of the Turk's Head for the best looking result. 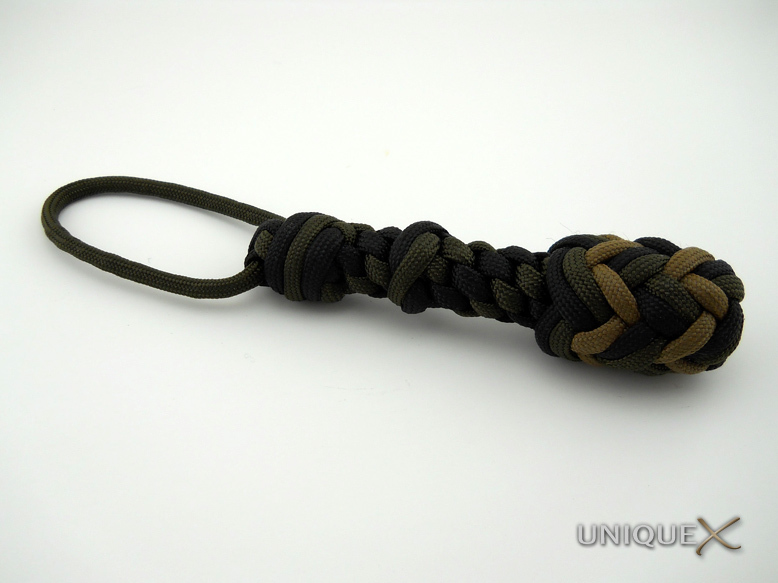 The Ladder Rack Star Knot Fob is deceptively easy to tie and doesn't require very much paracord. 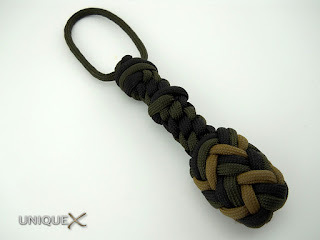 Gather Five feet of olive drab and two feet of coyote brown paracord. Start by tying a Two Strand Matthew Walker Knot and leave room for the loop size you desire. Now follow the instructions for the Ladder Rack Knot, but weave in the coyote brown strand after you get the first loop started, then it will go back and forth between olive drab and coyote brown. Once you reach the bottom, you should have four strands remaining. As far as I know, there are no tutorials available for a four strand Star Knot, but if you follow the instructions in this tutorial and do the same thing only with fewer strands, you can easily tie this knot. I think many folks in the knot tying community consider this knot to be a challenge, but it isn't. Just follow along with the tutorial and if you get stuck, I will be glad to help. You may also want to search for a video or another tutorial for any of the knots used in the article, just because I found them satisfactory, that doesn't mean that you will.